Maybe you’ve fallen and cracked a tooth on the sidewalk, or maybe you have a toothache that’s been building and building to the point that the pain is unbearable. In these frightening and uncomfortable situations, it can be easy to give into panic, but do your best to stay calm. If you’re in Dr. Phillips, Lake Buena Vista, or another nearby area, please give the Sand Lake Dental team a call today. Dr. Ziyad Maali regularly treats emergency cases, and he and the rest of our team do everything in our power to accommodate patients into our schedule as soon as we possibly can here in our Orlando dental office, and in most cases, we’re able to see patients on the same day they call. If you ever experience an emergency you believe may be life threatening, please contact emergency services or proceed to your nearest emergency room. Once we’re sure you are not in danger, we will be happy to partner with the medical team to repair any damage to your smile. Make sure the damaged area is clean by using cool water to remove any debris. However, do not brush, floss, or use toothpaste to clean the area unless directly instructed to do so by the dentist. Retrieve any large pieces of the tooth or dental restoration. Handle them by the biting surface of the tooth not the root structure. Run cool water over the tooth or restoration to remove debris. If possible, replace a lost tooth in the vacated socket. If not, place the tooth in a container with water or whole milk, until you reach our office. Place pressure on soft tissue lacerations using gauze or clean cloth to slow bleeding. Ice packs or cold compresses can be used at 20 minute intervals to prevent swelling, reduce pain, and slow bleeding. Use pain relievers as directed, but do not place an aspirin or other analgesic directly onto the damaged tooth as this can create further health issues. If a piece of food or other foreign debris is stuck between teeth, use floss to try to remove the item. Do not use sharp objects or tools to pry the item lose as you may accidentally damage the soft tissue. Make sure to brush and floss teeth daily and visit the dentist two times each year to keep teeth whole and health. Do not use teeth to open packages or crack nuts as this may lead to tooth damage. Kick your nail biting, pen chewing, or ice eating habits. 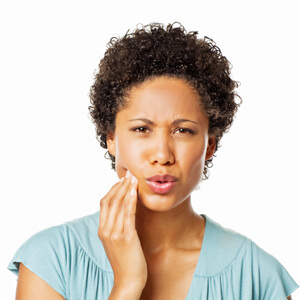 This additional stress on tooth enamel increases the risk for dental wear, cracks, or chips. Wear mouthguards to protect teeth at night if you grind and clench teeth, and always wear a sportsguard during athletic practices and competitions to avoid injury.